Neck sprains and strains, commonly known as whiplash, are the most frequently reported injuries in U.S. insurance claims. In 2007, the cost of claims in which neck pain was the most serious injury was about $8.8 billion, or 25 percent of the total payout for crash injuries. Head restraints help prevent whiplash. When a vehicle is struck from the rear, the seatback pushes against an occupant’s torso and propels it forward. If the head is unsupported, it lags behind the torso until the neck reaches its limit, and the head suddenly whips forward. A good head restraint prevents this by moving an occupant’s head forward with the body during a rear-end crash. Head restraints should be properly adjusted. The top of the head restraint should be even with the top of the head or, if it won’t reach, as high as it will go. The distance from the back of the head to the restraint should be as small as possible. 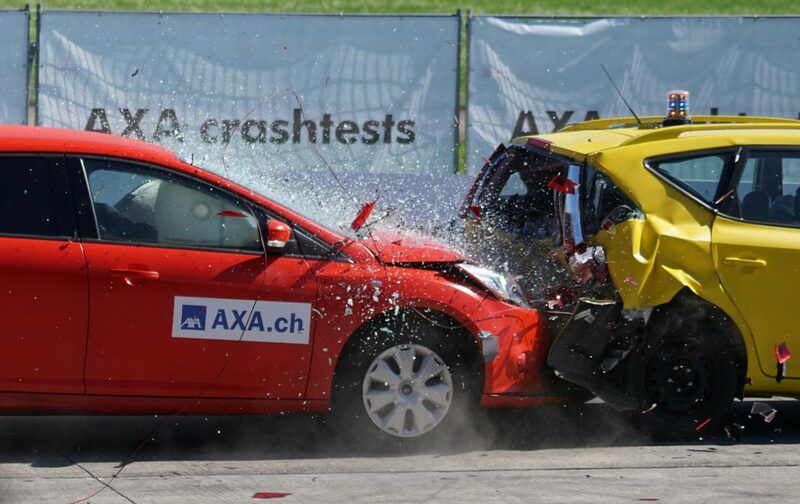 Insurance Institute for Highway Safety (IIHS) evaluates a vehicle’s crashworthiness with the help of five tests: moderate overlap front, small overlap front, side, roof strength and head restraints & seats. For front crash prevention ratings, the Institute conducts low- and moderate-speed track tests of vehicles with automatic braking systems. IIHS also conducts evaluations of headlight systems and of the child seat attachment hardware known as LATCH. The descriptions below explain how each test is conducted and how the results translate into ratings. Neck sprains and strains are the most frequently reported injuries in U.S. auto insurance claims. Such whiplash injuries can be sustained in any type of crash but occur most often in rear-end collisions. Good head restraints can help prevent them. IIHS tests vehicle seats and head restraints with a special dummy that has a realistic spine. The vehicle seat — with the dummy in it — is placed on a sled, which is moved to simulate a rear impact. Good geometry is essential for an effective head restraint. If a head restraint isn’t behind and close to the back of an occupant’s head, it can’t prevent whiplash in a rear-end collision. IIHS evaluates the geometry of head restraints in passenger vehicles based on the height and backset relative to an average-size male. A restraint should be at least as high as the head’s center of gravity, or about 3.5 inches below the top of the head. The backset, or distance behind the head, should be as small as possible. Backsets of more than about 4 inches have been associated with increased symptoms of neck injury in crashes. The restraints are measured with the angle of the torso at about 25 degrees, a typical seatback angle. IIHS classifies each restraint according to its height and backset into one of four geometric zones — good, acceptable, marginal or poor. Head restraints have improved since the Institute first began rating them. In 1995, only 3 percent of measured head restraints received good geometric ratings, while 82 percent were rated poor. Among recent models, most head restraints have good geometric ratings, and the rest are acceptable. IIHS ratings have forced manufacturers to pay attention to head restraint design. More recently, a government standard in effect since September 2010 requires a minimum of 29.5 inches from an occupant’s hip to the top of a head restraint and a backset of 2.2. inches or less. This guarantees that nearly all new head restraints would be rated good for geometry by IIHS. Seats and head restraints with geometry rated good or acceptable are tested in a simulated rear impact conducted on a sled. The test assesses how well the seats support the torso, neck and head of a BioRID dummy. The test simulates a rear-end crash with a velocity change of 10 mph, approximately equivalent to a stationary vehicle being struck at 20 mph by a vehicle of the same weight. A seat/head restraint’s dynamic rating depends on performance in the sled test. There are two sets of criteria for evaluating performance. The first criteria are the two seat design parameters, time to head restraint contact (must be ≤70 milliseconds to pass) and torso acceleration (must be ≤9.5 g to pass). The second set of evaluation criteria is comprised of the maximum neck shear force and maximum neck tension measured on the dummy during the test. These neck forces (classified as low, moderate or high) indicate how well or how poorly an occupant’s head and neck would be supported in a rear impact at low to moderate speed. A seat that passes at least one of the seat design parameters and has low neck forces earns a dynamic rating of good.